and purchases as well as joint ventures. Thermoforming Solutions is working in conjunction with Plastics Machinery Group and have set up a company called Plastics Machinery Group International Ltd that sells and buys all types of plastics machinery. It has offices in the UK, USA and India and can help all companies to either improve their existing euipment or help to either sell off existing machinery. The company also has a vast knowledge in the sale and purchase of companies. Recently we have completed the start up of a joint venture between a European company and one in the mid east. This is the expertise that Plastics Machinery Group International and their partners can offer to the industry. Please Note: If you would like to make contact please email pmgi@plasticsmg.com. 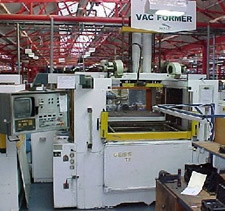 To view machinery that is available and please go to: www.plasticsmg.com. Copyright © Thermoforming Solutions Ltd. All rights reserved.